Cultivating excellence is striving for perfection and balance in the vineyard as well as the wine. 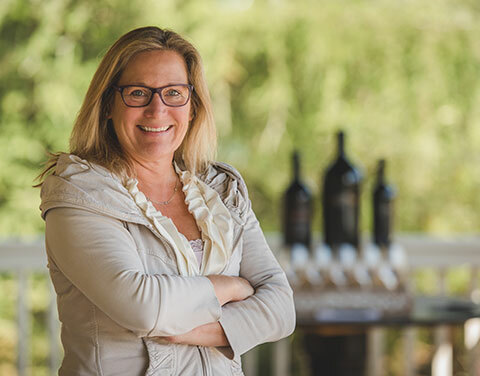 Pam’s greatest challenges are moving the company forward successfully while dreaming and crafting new wines. 33 years ago I took a job as a harvest intern under Bill Bonetti while studying for the dental admissions test. Needless to say, I never took the test and I began pursuing a lifelong path in winemaking. Mary Novak, who taught me that if we just go forward, all will be okay. Moving the company forward successfully while dreaming and crafting new wines. Our terrain has some of the most diverse terroir in a relatively small geographical area. Furthermore, our valley is buffered by the ocean, which maintains a temperate climate and diurnal temperature shifts that help our vines thrive. We rejuvenate the soil through sustainable practices, renovated our historic property to preserve Napa Valley history and reinvigorate traditional winemaking techniques with modern technology and innovation. I was on the path to be a dentist, but I could have been a contractor as well. Richard Graf, who founded Chalone Winery (I think he would be proud of me), Robert Louis Stevenson so that he could see that this wine truly is ‘bottled poetry’ and my paternal grandmother Rachel, who bought a convertible Thunderbird while living in the center of Canada because her critiques would keep me striving. I can be a bit of a homebody or an introvert, though no one would ever guess as I’ve been known to be lively at parties.